Giacomo Taldegardo Francesco di Sales Saverio Pietro Leopardi (June 29 1798 – June 14 1837) was an Italian poet and philosophical writer. ...the recognition of the irredeemable vanity and falsity of all beauty and all greatness is itself a kind of beauty and greatness that fills the soul when it is conveyed by a work of genius. And the spectacle of nothingness is itself a thing in these works, and seems to enlarge the reader’s soul, to raise it up and to make it take satisfaction in itself and its despair. 29th September 1823, Festival of Saint Michael the Archangel. Everything is evil. I mean, everything that is, is wicked; every existing thing is an evil; everything exists for a wicked end. Existence is a wickedness and is ordained for wickedness. Evil is the end, the final purpose, of the universe...The only good is nonbeing; the only really good thing is the thing that is not, things that are not things; all things are bad. No one can truthfully boast or say in anger: I cannot be unhappier than I am. 2nd January, 1829. Translation by W. S. Di Piero. Two truths that most men will never believe: one that we know nothing, the other that we are nothing. Add the third, which depends a lot on the second: that there is nothing to hope for after death. ICELANDER -- So say all the philosophers. But since that which is destroyed suffers, and that which is born from its destruction also suffers in due course, and finally is in its turn destroyed, would you enlighten me on one point, about which hitherto no philosopher has satisfied me? For whose pleasure and service is this wretched life of the world maintained, by the suffering and death of all the beings which compose it? Its birthday is a day to mourn. uor che l'uom sue prosapie ha men feconde. 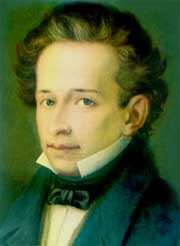 What is Leopardi's place in literature? That assigned to him by his countrymen is very high, higher than they would concede to any other Italian poet born since the close of the sixteenth century. For him, death does not just end life; it nullifies life, and the fact that we are going to die is the only fact that matters. The key to the terrible power of his work is that we can never totally banish the suspicion that he might be right. Adam Kirsch, "Under the Volcano: Giacomo Leopardi's radical despair.". The New Yorker. October 25 2010. How should the endless rush of events not bring satiety, surfeit, loathing? So the boldest of us is ready perhaps at last to say from his heart with Giacomo Leopardi: "Nothing lives that were worth thy pains, and the earth deserves not a sigh. Our being is pain and weariness, and the world is mud—nothing else. Be calm." Friedrich Nietzsche, On the Use and Abuse of History for Life. (1874). Translation by Adrian Collins. Nobody more than Leopardi could look disaster in the face, never denying that it was disaster, yet at the same time turning unhappiness itself into a colour or fragrance that would help you through the day. Tim Parks, "The great disillusionist: In an age when so many people are at a loss to give life meaning and direction, Giacomo Leopardi is essential reading". Aeon. Yet no one has so thoroughly and exhaustively handled this subject as, in our own day, Leopardi. He is entirely filled and penetrated by it: his theme is everywhere the mockery and wretchedness of this existence; he presents it upon every page of his works, yet in such a multiplicity of forms and applications, with such wealth of imagery that he never wearies us, but, on the contrary, is throughout entertaining and exciting.